So you’re a blogger and you want to know what looks best for your viewers. A proper blog post layout is critical for keeping a reader’s attention and improving your SEO. Take some advice from the pros. Here are the insider tips on making your blog look more professional. There are many reasons why people use blogs, but there is always one common theme all writers share: they want people to read them. How do we get actual views instead of just clicks? Well, SEO and quality content can be great for getting boosted on Google and getting traffic, but getting people to actually read your article is a large part of the battle. You know all about using links and providing relevant information, but people tend to lose interest in an article when the layout makes it difficult. This is especially true when there are big walls of text or any difficulty in navigating to the information they are seeking. Here are a few simple ways to improve the layout of your blog to keep your audience reading. Following these tips will help keep your readers’ attention, but also grow your audience with tips on making your blog friendly for mobile users. Almost every blog will have headers, but subheaders are just as important. Use at least 2 sentences – Under each header or subheader, there need to be at least two sentences before you move onto the next one. Use this section as an example. If the header is “7 Insider Tips”, give an introduction to the segment before using a subheader for your first example. Keep it relevant – Any information that needs a subheader should only be added when it is relevant to the category of the header. Break up text – Using subheaders can be a great way to break up big walls of text, which makes it more appealing to the reader. Use subheaders rich in keywords to keep readers interested, and to boost SEO. This is meant literally. When the format used on a few popular blogging sites is too wide, it can frustrate the reader, especially for mobile users. Have you ever read an article on your phone and had to scroll from side to side to be able to read each sentence? WordPress users should consider using Flywheel to make your blog easier to view on mobile devices. Our brains receive information faster from images than through text. This can be useful for not only keeping the reader engaged but for ensuring readers get the most valuable information of your post, even if they don’t read it all the way through. The cover image is most important. The cover image of your post is the first impression of your article, and should really “wow” your audience to make them want more. Find the best and most relevant images for your post. There are great stock image websites you can use to captivate your readers. In terms of the text in an article, is there anything that grabs your attention more than bold text? Especially if you have a long wall of text, emphasize an important point by making it bold. Many people reading an article will find themselves reading a paragraph, noticing bold text below, skipping ahead to read that part, and going back to see what led up to that information. Bold text pops out more and is more attractive than italics. Using italics after your conclusion for a separate announcement for your company or blog can be okay, but keep them out of the post. Notice the format of the articles in this post? Going back to “walls of text”, they make it difficult for readers to follow. Breaking up the information and making one quick point in each short paragraph can go a long way for readability. Try it out! Honestly, it even makes proofreading your own work easier. You’re welcome! This should go without saying, but your introduction needs to convince your audience to read the rest of your article. For introductions, remember AIDA. Grab their attention, create interest, inspire desire, and take action. Check out some more info on writing irresistible introductions. When the body has no more information to give, it is time to wrap up the article with a conclusion. Here are the tips. Always have a header for your conclusion, and use a “call to action” (CTA) at the end. This could be a great opportunity to offer your reader a link to a product or service your company offers. For example, at the end of an article about the best acne creams (if you offer the product), you can finish your conclusion with: “Feel more confident with how you look. Get your skin clear today” and offer a link to your product. This helps end on a strong note and generate more business, as people are more willing to check it out after learning about it. Use proper capitalization in your paragraphs for proper names, but also for your headers and subheaders. This makes your post look more professional, which builds trust in your blog. Capitalize My Title is a free online resource to see which words in your headers should be capitalized, and which ones shouldn’t. Every blog has some room for improvement, but that shouldn’t discourage you from doing what you can. Simply following these steps can go a long way in improving your blog post layout and the results to your blog. 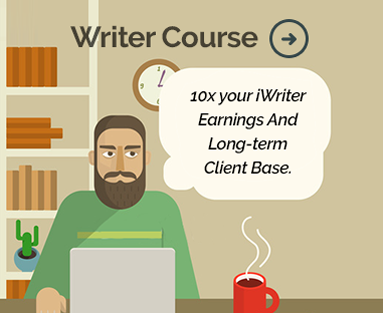 If these steps aren’t enough for you, check out our writer course online to keep growing your skills!